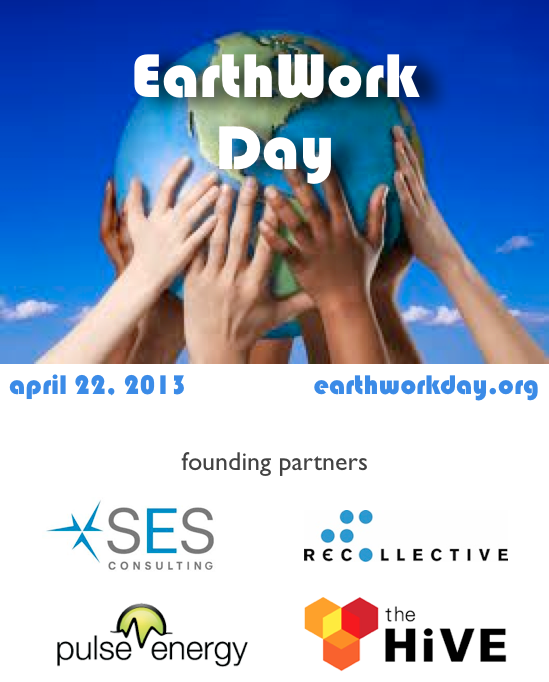 Recollective Consulting | EarthWork Day 2013! EarthWork Day is about celebrating Earth Day by walking the talk. Last year, SES Consulting, Recollective, Pulse Energy and HiVE decided to celebrate Earth Day in a new and exciting way. Their employees were given a budget of $22 per person to have some fun making a difference in a creative way around their community. EarthWork Day 2012 was such a success we’ve decided to do it again and we’re inviting more organizations to join us! Between March 22 – April 22, groups are to begin coordinating to plan their ideas so they’re ready to implement on April 22. Check out the videos from the 2012 EarthWork Day Ideas Pitch here! 10am: Leave HiVE to implement project ideas. Choose at least one person to photo/video document. 5pm: Drink, eat, be merry! Anyone and everyone are welcome to join, or create your own version! Please spread the word! If you’re a business / non-profit interesting in participating, please send an email to action@earthworkday.org and we’ll add your logo and weblink below. Also open to individuals! ← Welcome Aaron Lavalle to Recollective as newest Intern!